A brilliant yet secretly tortured artist, Whitney Houston’s life was cut short well before it should have been and the world lost one of the greatest singers of all time. If one were to compile a list of the greatest female singers of all time it would certainly include Aretha Franklin, Judy Garland, Barbra Streisand, and Mariah Carey. The list, of course, would be incomplete though without the addition of the incomparable Whitney Houston. The daughter of Cissy Houston and cousin of singer Dionne Warwick, Whitney became one of the top selling female artists of all time. While her public persona was one of innocence and love, her personal demons took its toll on her, eventually contributing to her untimely death at the age of forty-eight. Whitney, the documentary that came out earlier this year, looks at her life and career from some of the people who knew her best. Whitney Houston made her singing debut as a teenager in her local church and immediately blew everyone away. Her voice was truly a gift from God that could have made angels weep. She had a mature and soulful sound that deserved to be trained and nurtured and her mother, Cissy – a professional singer herself- took it upon herself to groom Whitney in preparation for the spotlight to come. Beautiful, talented and sweet, Whitney Houston was a perfect fit for the pop world. In 1985 her first album, Whitney Houston went to number one on the Billboard 200 in the United stated followed by her sophomore album, Whitney, in 1987. She became the only artist to have seven consecutive number one singles on the Billboard Hot 100 list. She seemed unstoppable as fans all over the world fell in love with her. Then in 1992, Whitney starred alongside Kevin Costner (Dances with Wolves) in The Bodyguard, her first film role. While the film was harshly criticized, fans loved it and the soundtrack spawned probably Whitney's most iconic song, I Will Always Love You. During this time she also married notorious bad boy Bobby Brown and had her only child, Bobbi Christina. After having been in the spotlight for so many years, the pressure took its toll on Whitney and rumors of drug use surrounded her. As time wore on it became evident that there was merit to the rumors. After divorcing, Whitney struggled to get her life in order but seemed to be somewhat succeeding. Then on February 11, 2012, news broke of her death by drowning attributed to drug use. Just days before the Grammy awards the world mourned the loss of such an amazing talent. Whitney documents this incredible woman and her career. With interviews from her family, including her mother and brothers, Clive Davis who signed her to Arista Records, Film Agent Nicole David, ex-husband Bobby Brown and a plethora of celebrities, we get a glimpse inside the world she lived in and how she made those around her feel. Director Kevin Macdonald (State of Play) takes the audience gingerly along for the ride as those who knew her best tell tales of the simple girl hiding inside the superstar. While the focus is on her early life and spectacular career, there are moments that touch upon the less glamorous side of her life including her drug use and accusations of sexual assault when she was a child. Interestingly, some on camera speak candidly while others clearly deny the obvious, especially Brown who refuses to even admit Whitney had a drug problem let alone how it contributed to her death. The Blu-ray offers one disc and a digital download and is presented in 1080p high definition video with a 1.78:1 aspect ratio. The quality is good even during the grainier home video offerings. The DTS mast audio 5.1 certainly showcases that angelic voice beautifully but if the recordings had been newer I would have liked to see the film presented in Dolby Atmos. The disc has an audio commentary with Producer Simon Chinn (Searching for Sugar Man) and Macdonald and a motion Photo gallery as the only extras. A brilliant yet secretly tortured artist, Whitney Houston's life was cut short well before it should have been and the world lost one of the greatest singers of all time. Whitney is a loving tribute to the artist and the woman while not shying away from the controversy. Let this movie serve to remind of the brilliance of her gift that she shared with all of us. 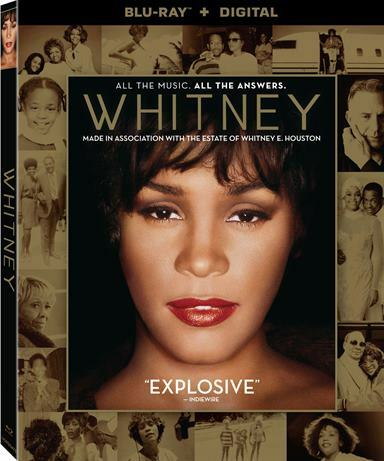 Download Whitney from the iTunes Store in Digial HD. For more information about Whitney visit the FlickDirect Movie Database.